Comfortable, elegant panniers with foam-supported shape. Well-organized with outer net compartment, large front compartment and several inner compartments. Solid handle, detachable shoulder strap, reflectors on both sides, separate rain cover. 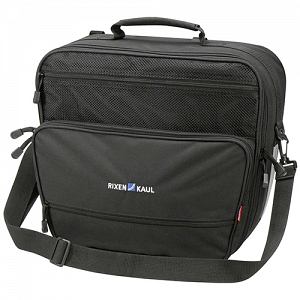 Two-way zippers allow convenient access even when bag is used in combination with a topcase. Can be packed like a suitcase. Due to the asymmetrical rail position, available only in pairs. Bags are safely locked into the side slits of the carrier adapter and can be combined with boxes, topcases or baskets. For carriers without carrier adapter, you can buy the same bag (as a single item) equipped with Universal rail.